On a lightly oiled or non-stick cookie sheet, spoon out about 2-4 heaping tablespoons of the mixture for each cake. In the photo above we made six large oven cakes. By using less, you could make twelve small oven cakes. Place the peach slices on the oven cakes. 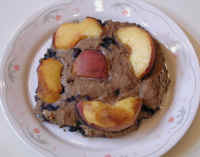 The peaches and blueberries make their own syrup for the Oven Cakes, or they may be served with Maple Syrup or your favorite topping.